The Texas Republican Party came together last week to adopt a platform. If you think the garbage coming out of Donald Trump’s mouth is bad, check out the worst of the racist, transphobic, homophobic, anti-abortion, sexist priorities the Texas GOP will be pushing for in the coming years. Most are regressive, oppressive, and reactionary, some are just wacky — and yes, all 266 planks were approved individually. As if Texas’ restrictive voter ID law wasn’t enough, Texas Republicans want to make it even harder for Texans to register to vote. Oh and why not repeal the entire Voting Rights Act? I guess holding the distinction of the second lowest voter turnout state isn’t good enough for these guys. Republicans doubled-down on their opposition to Medicaid expansion, which would accept free federal funds and save the state billions of dollars while improving the health and well-being of more than one million Texans. 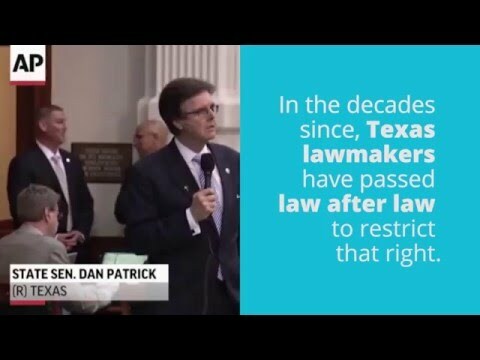 With more than 10 planks targeting gay and transgender Texans, the GOP made clear that LGBT equality is still very much in its crosshairs, saying homosexuality “must not be presented as an acceptable alternative lifestyle” and claiming the right to discriminate in the name of so-called “religious freedom” and “family values.” In addition to expressing their desire to overturn marriage equality, the platform also includes a plank on “reparative therapy” for LGBT youth, and, of course, on banning transgender people from using restrooms that match their gender identity. Conspicuously absent from the 266 planks are any policies aimed at creating economic opportunity and raising incomes for hard-working Texans. Instead, the Texas GOP wants to repeal the minimum wage — even though at $7.25 an hour Texas’s minimum wage is not even close to a living wage — and to drug test welfare recipients — a stigmatizing policy that has been shown to actually cost states money when they’ve tried it. At a time when the Texas public education system faces serious problems and Republicans should be focused on putting students first, they thought it was really important to call for the abolishment of the U.S. Department of Education and for teaching “all sides” in classroom discussions of evolution and climate change. Texas Republicans support Donald Trump’s outlandish plan to build a wall along the U.S. border with Mexico — theirs would inexplicably include a “wide gate” — and they want to block all measures, like DAPA and DACA, that provide undocumented immigrants a pathway to citizenship. They also want Texas to slam the door on refugees. The GOP platform wants to privilege Christian beliefs over others, but insists that it doesn’t want institutions to give “special concessions to accommodate religious practices. Which is it?